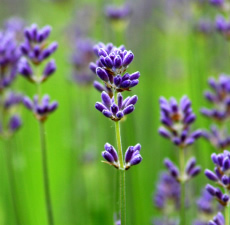 Traditional Use: Lavender oil is known for its skin healing properties and its use as a sedative. The herb has been used for strewing, and the flowers are used as an aromatic. Properties: Analgesic, anti bacterial, anti depressant, anti-inflammatory, anti microbial, anti rheumatic, antiseptic, anti spasmodic, aromatic, carminative, cholagogue, deodorant, diuretic, emmenagogue, hypotensive, insecticide, nervine, sedative, stimulant, stomachic, vulnerary. Benefits: Acne, allergies, amenorrhea, asthma, athlete's foot, bruises, burns, colic, conjunctivitis, cystitis, dandruff, depression, dermatitis, earache, eczema, flatulence, halitosis, headache, hypertension, indigestion, infection, inflammations, insect bites and stings, insomnia, laryngitis, leucorrhea, migraine, nausea, nervous tension, neuralgia, psoriasis, rashes, rheumatism, scars, slow digestion, sore muscles, sprains, stress, sunburn, teething, toothache, ulcers, wound. Lavender oil is a good addition to most skin care products. For bug bites and burns the oil is generally safe to apply neat to the affected area. A skin patch test should be performed before using any essential oil directly on the skin.